Your weeknight go-to just got even easier. Fast, easy, and delicious results! As with all microwave products, I've needed to fiddle with the timing as I have a small microwave. I've experimented with new off-the-cuff recipes with much success. The booklet has been very helpful. Caution...I did burn my finger draining the pasta once, so be careful. I need to get a few more for other friends! Teacher friend loves home cooked meals after a long day yet is short on time. 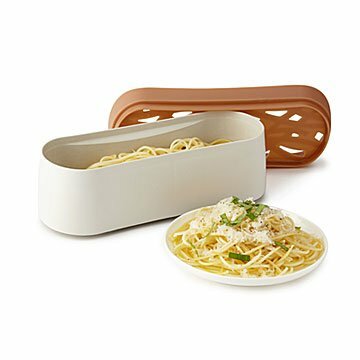 This is perfect because it saves time boiling water, washing a large pasta pot, etc. Great gift for those with limited cooking skills. Follow directions... time will depend on the microwave.